The administration’s aggressive crackdown on undocumented immigrants is pushing women into the shadows. If President Trump’s political ascent has shown anything, it’s that he’s an expert manipulator of the legal system. Armed with legions of corporate lawyers, he has been able to shield himself from charges of sexual harassment and fraud. Perhaps unsurprisingly, though, Trump’s proposed budget would deny access to legal justice to those less fortunate—particularly two groups he’s notorious for abusing throughout his career: women and immigrants. Trump’s budget is abusive on many fronts: First, Trump and the Republicans’ budget plans would slash funding for the Legal Service Corporation, a national network of lawyers providing critical legal assistance for the poor. More than two-thirds of legal aid clients nationwide are women, and many of their main legal problems are related to domestic violence. By curtailing access to legal services and other community-based supports, including survivors’ ability to seek justice and financial relief in court, Trump’s social-service cutbacks would further expose domestic-violence victims to prolonged suffering, mental and physical trauma and the economic abuse and impoverishment that arises when women lack the financial resources to break from their abusers and support themselves through work. Among these clients, migrant women were especially vulnerable, even before Trump took office. A recent case in Colorado, for example, involved a woman who migrated with her abusive spouse and suffered repeated brutality at his hands for her first decade in the United States, kept captive in her home by her husband. After she fled and sought a protective order, her husband tried to drag her back to their home country. An LSC attorney helped obtain a divorce for the woman, and was able to resettle her independently in the United States. The Trump administration’s ferocious immigration crackdowns are also making it harder for women facing abuse both to avoid deportation and escape abusers. Survivors may be even more terrified of police than of staying with their abusers as Attorney General Jeff Sessions pressures local law-enforcement authorities to cooperate with the hard-line enforcement tactics of Immigration and Customs Enforcement (ICE). Despite mounting local opposition, it’s increasingly difficult for cities to shield undocumented abuse survivors from ICE crackdowns. Trump is now embroiled in legal battles over attempts to penalize so-called “Sanctuary Cities,” which have pledged to protect immigrants from federal interference. Countless families in crisis now face further uncertainty in weighing the relative risks of trying to break out of abuse. According to advocates, although deportation cases are handled separately in federal immigration courts, women are often “less likely to leave their abusers due to fear of immigration consequences, such as being separated from children.” Limiting justice in one court system automatically limits her options to defend her basic human rights in another. 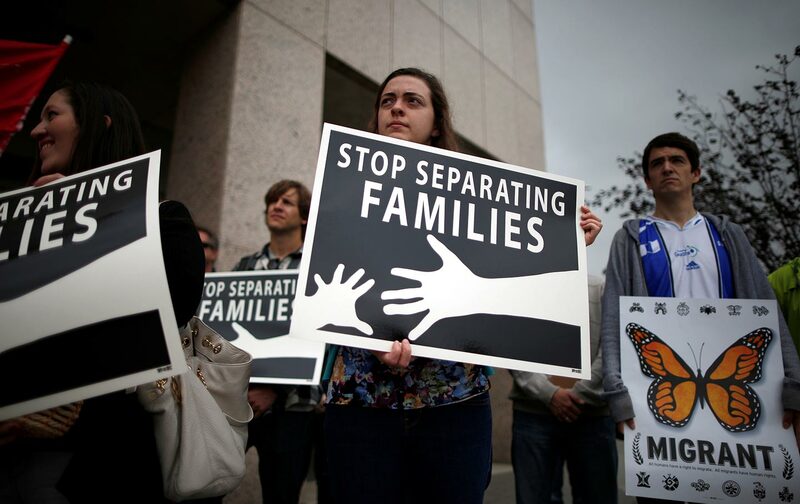 According to a recent survey of advocacy groups by Tahirih, three-quarters of advocacy organizations “report that immigrant survivors have concerns about going to court for a matter related to the abuser or offender.” About 40 percent of advocates had worked with immigrant survivors who dropped civil or criminal cases because of fear of deportation. It seems virtually any contact with government could trigger a deportation order. Of the tens of thousands of people arrested by ICE under Trump, it is unclear how many are victims of crime or abuse, but rates of non-criminal arrests have reportedly spiked. Even once-routine check-ins with local immigration offices have led to detentions. Given the Trump administration’s ongoing standoff with sanctuary cities and focus on tracking immigrant-related crime cases, abuse survivors seem justified in their fear of reporting to authorities, even if they were victims. Their fears might deepen amid the severe defunding of legal services, which would further limit a victim’s access to lawyers, who could make the difference between a safe divorce in family court and indefinite detention at an ICE cell block. There are in fact longstanding federal laws aimed at protecting survivors by granting deportation reprieve if they cooperate in a domestic violence law-enforcement investigation, including special visas for victims of human trafficking, a crime that disproportionately affects immigrant women. Grace Huang, an attorney with Asia Pacific Institute on Gender Based Violence, said the study underscores how critical it is that lawyers be able to navigate separate spheres of civil and immigration law when dealing with the aftermath of abuse, including child-custody battles and restraining orders, securing stable housing, applying for benefits as a noncitizen, and finding culturally appropriate resources such as crisis counseling and shelters that speak a client’s native language. But conservatives are poised to slash resources across the board for immigrant women in distressed and violent situations. Trump’s policy priorities seem to be bent on making abused women more vulnerable on all fronts. And for the women who are stuck at the margins of the legal system, their only choice is increasingly between political patriarchy in Washington and violent patriarchy at home.